Go for a pink sequin evening dress and you'll exude elegance and polish. Bump up this outfit by slipping into silver leather heeled sandals. A black chiffon long sleeve blouse and black leather shorts? This is easily a wearable ensemble that you can rock a version of on a daily basis. Complete your look with a pair of silver leather heeled sandals and you're all done and looking smashing. Breathe a polished touch into your daily fashion mix with an orange tuxedo dress. Introduce a pair of silver leather heeled sandals to the equation and you're all done and looking incredible. No matter where the day takes you, you can rely on this casual pairing of a grey maxi dress. 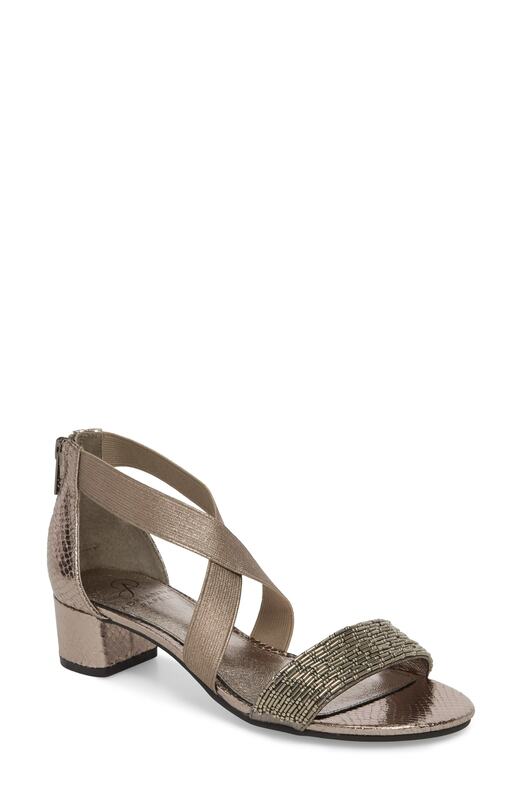 Throw a pair of Adrianna Papell Teagen Block Heel Sandal from Nordstrom in the mix for a hint of elegance. Opt for a white tuxedo dress to be the picture of polish. A pair of Adrianna Papell Teagen Block Heel Sandal integrates nicely within plenty of combos. For an ensemble that's super simple but can be manipulated in a variety of different ways, pair a white cropped top with a light blue tulle full skirt. Balance this getup with a more polished kind of footwear, like these silver leather heeled sandals. A blue leather biker jacket and beige floral skinny pants are among the crucial pieces of a great casual collection. Complement your outfit with Adrianna Papell Teagen Block Heel Sandal from Nordstrom to completely switch up the outfit. This combo of a grey wool blazer and black shorts is ridiculously chic and yet it's casual and ready for anything. A pair of Adrianna Papell Teagen Block Heel Sandal from Nordstrom will add a dash of sultry class to your ensemble. If you're scouting for a casual yet absolutely chic outfit, consider wearing a white embroidered crew-neck t-shirt and grey capri pants. Feeling transgressive? Break up your ensemble by finishing off with a pair of Adrianna Papell silver leather heeled sandals.